“To everything there is a season, A time for every purpose under heaven: A time to be born, And a time to die; A time to plant, And a time to pluck what is planted; A time to kill, And a time to heal; A time to break down, And a time to build up; A time to weep, And a time to laugh; A time to mourn, And a time to dance; A time to cast away stones, And a time to gather stones; A time to embrace, And a time to refrain from embracing; A time to gain, And a time to lose; A time to keep, And a time to throw away; A time to tear, And a time to sew; A time to keep silence, And a time to speak; A time to love, And a time to hate; A time of war, And a time of peace”. (Ecclesiastes 3:1‭-‬8 NKJV). 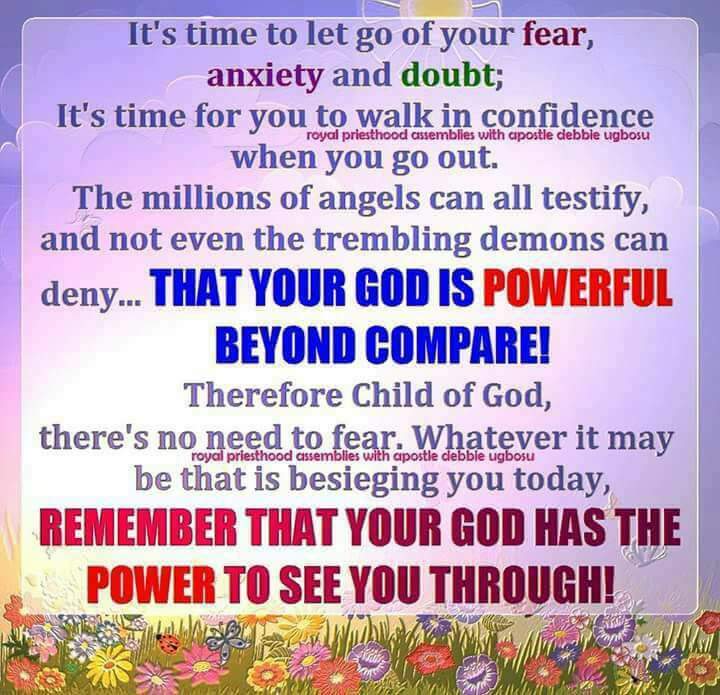 It’s time to bury your fears , and weaknesses , because the Bible said,”For God has not given us a spirit of fear, but of power and of love and of a sound mind”( 2 Timothy 1:7 NKJV). “Be anxious for nothing, but in everything by prayer and supplication, with thanksgiving, let your requests be made known to God; and the peace of God, which surpasses all understanding, will guard your hearts and minds through Christ Jesus. Finally, brethren, whatever things are true, whatever things are noble, whatever things are just, whatever things are pure, whatever things are lovely, whatever things are of good report, if there is any virtue and if there is anything praiseworthy—meditate on these things”. ( Philippians 4:6‭-‬8 NKJV). This entry was posted in Daily Message and tagged the time has come.